This unusual name is a variation of the English and French surname "Court", also found as "A'Court" with the Anglo-Norman French preposition. It was used as an occupational or a habitation name for one who lived or worked at a manorial court. The derivation is from the Middle English "court(e)", or "curt", meaning "court", from the Latin "cohors", a yard or enclosure. The word was mainly used with reference to the residence of the lord of a manor. 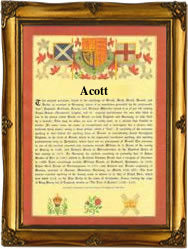 It is also possible that "Acott" is derived from the Olde English pre 7th Century "atte cott", which denotes residence "at the cottage". One Joseph Acott was christened in London in 1747, and Elizabeth Acott married James Cary on December 29th 1785, at St. Michael's, Bath, Somerset. The first recorded spelling of the family name is shown to be that of Joan Acott, which was dated June 22nd 1673, marriage to William Manchester, at St. Dunstan's, Stepney, London, during the reign of King Charles 11, known as "The Merry Monarch", 1660 - 1685. Surnames became necessary when governments introduced personal taxation. In England this was known as Poll Tax. Throughout the centuries, surnames in every country have continued to "develop" often leading to astonishing variants of the original spelling.